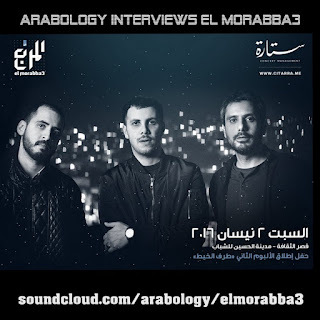 Arabology is proud to feature a new interview with the Jordanian post-rock indie group El Morabba3 (Muhammad Abdullah, Odai Shawagfeh, Dirar Shawagfeh) to coincide with the release of their second album "Taraf El Khayt" on April 2,2016. In 2008, songwriter/bassist/vocalist Muhammad Abdullah (a.k.a Abdullah) decided to form a group. As he looked for other band members, he met Dirar Shawagfeh, who has been described by recommenders as "a drummer that is just different". After 3 sessions, a roommate of a friend of Abdullah, guitarist/producer Hamza Arnaout from the band Autostrad recommended inviting Dirar's brother Odai Shawagfeh for a jam, which at the time was not of an interest because the yet-to-be formed band was not looking to add a guitarist to the band, but Arnaout said "If you are not looking to add a guitarist then invite Odai anyway", which provoked their curiosity. The meeting happened, a bassist/songwriter with smooth yet edgy voice and dreamy lyrics, and the Shawagfeh brothers, a drummer with very creative grooves and a guitarist/producer who makes the guitar say something new every time, and fills the space with his minimal style and layers of keys/Synth sounds. تتألف فرقة المربّع من محمّد عبد الله، بصوته و كلماته الناقدة، و عدي شواقفة، الذي يخلق الأصوات البعيدة و القريبة التي تملأ الفراغ بين الكلمات، و ضرار شواقفة، بإيقاعاته التي تحمل الكلمات و الألحان و الأصوات و تضيف لحنا ايقاعيا عليها. المربّع هو نافذة نرى من خلالها أشياء نريد التعبير عنها..يمكنكم التخيّل ماذا نرى في هذا الجزء من العالم.."